I waltz through the stable doors. It's Thursday AKA the best day of the week! Why, you ask, because on Thursdays I have my riding lesson! "G'day!" says Gordy the stable hand. I smile at him and he smiles back. I flounce over to the white board and look for my name - and the horse I'll be riding's name next to it. I scroll down. Then I see the name. Wren. Who's Wren? I usually ride Mystic or Barbaro. "Who's Wren?" I ask my instructor Ms. Hannah. "The new horse," she replies, "She's a thoroughbred, I know you love thoroughbreds, Jenna. She's in stall 7." I run over to stall 7. There before me is the most exquisite horse I've ever seen. Wren is a dark bay thoroughbred mare. She has a lovely thick mane and tail and a near perfect jumping composition. The white star on her forehead really brings out her gorgeous dark brown eyes. She walks over to me and that's when I realize how strong she is. The girl's pure muscle! "Hey sweet thing," I whisper to her as I slip into her stall. I stroke her velvety muzzle. I gently brush and saddle her. Then I take her bridle and slip the cool metal snaffle into her soft mouth. I take my time adjusting her bridle before leading her out of her stall. 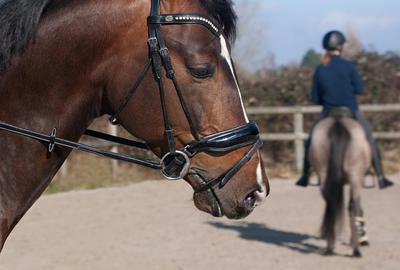 I slip my black helmet over my auburn ringlets before tightening my girth and getting on. I land softly onto Wren's back. She sighs and we walk around the arena. "Hi Jenna!" calls a voice. I turn around to see, Katie. I notice that Kayla's on Ace, a black thoroughbred gelding. "Seems like I didn't get the thoroughbred memo," says AJ as he walks his Canadian warmblood, Axel up to us. "Less chit-chat more riding!" Says Hannah. We take our horses out to the rail to begin the lesson. Let's just say it was the best lesson ever! Great start! Please keep writing!